This category of sediment control practices encompasses several different technologies, all of which remove sediment by slowing runoff and filtering suspended particles and associated contaminants. The physical presence of a barrier acts to reduce runoff velocities, which promotes settling of solids, while the permeability of the barrier allows solid particles to be filtered by the media as runoff pass through it. Technologies such as compost biofilters, straw bales, geotextile fabrics and vegetated filter strips may all be classified as permeable barriers. 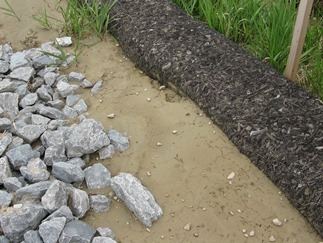 Barriers are made of various materials and may be configured in a variety of ways depending on the location, volume and nature of the runoff being treated. For example, biofilter socks (consisting of a mesh tube filled with organic compost) can be used around a storm inlet to treat shallow sheet flows, or alternatively the socks can be stacked high to treat greater volumes of channeled outflows. Some filter media may rely primarily on physical filtering processes to remove pollutants, while other media such as compost or vegetation may also enhance pollutant removal through chemical and biological reactions within the media.